Spring, the season of new growth and blooming flowers (and lots of pollen), is here! Along with the start of Spring comes the beginning of baseball season, The Masters, home shows and Spring home tours. 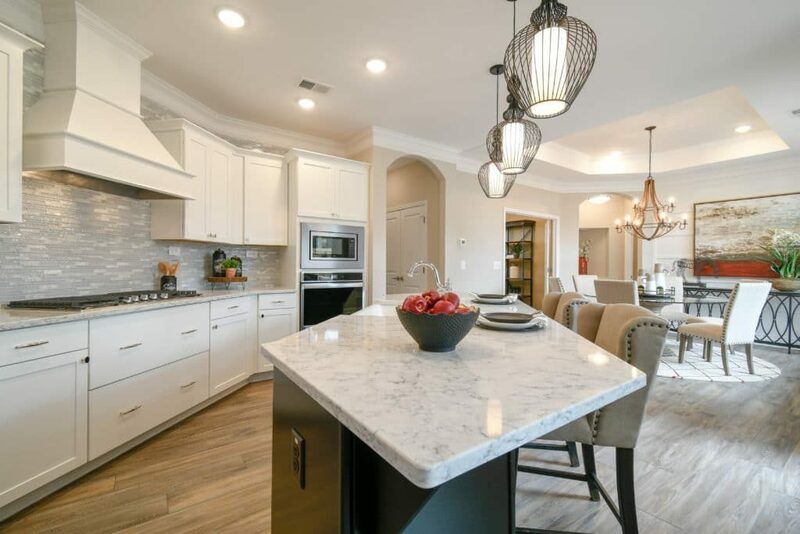 If you’re searching for a new home, the month of April is the perfect time to visit a Traton Homes community and tour one of the builder’s six model homes during the Altogether More Model Home Tour. 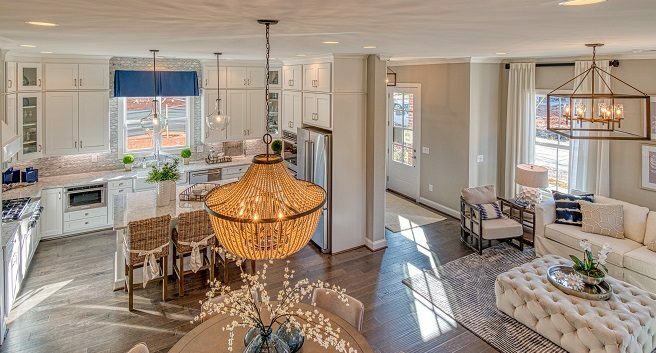 Traton’s tour of beautifully decorated model homes offers something for every metro Atlanta home buyer. You can tour a range of home styles including single-family homes, townhomes and even homes built for active adults. Or, find the perfect upgraded home for your growing family, downsize to a smaller home, or realize the American dream of homeownership as a first-time buyer. Traton’s communities are located throughout the metro area and even include the most desirable amenities, with locations walkable to nearby restaurants and shops, walking trails, swimming pools, dog parks and more. In addition to the opportunity to tour these beautiful model homes, Traton Homes invites you to participate in its social media contest by taking a photo at one of the model homes and posting it on Facebook with #AltogetherMoreContest. Post a photo of yourself in the home, or post a picture of your favorite space within the model. Either way, make sure your post is set to public so it can be seen, and you’ll be entered to win! Traton Homes is giving away a $25 gift card to Home Depot each week in April! 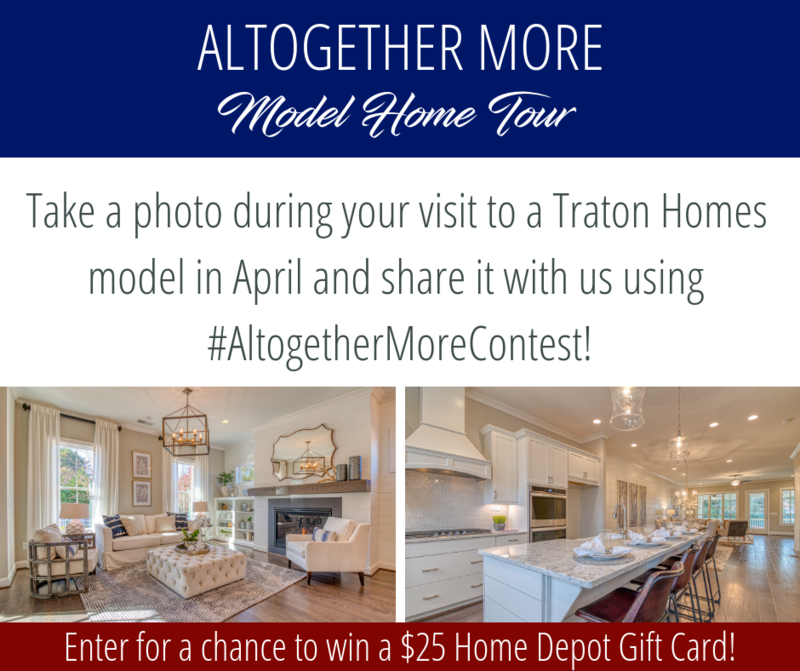 You can also use #AltogetherMoreModelTour any time you visit a Traton Homes model and post a photo online for a chance to be featured on Traton’s social media sites! North Square is just minutes from the Marietta Square offering easy access to the area’s best dining, shopping and entertainment. Townhomes in this popular community are priced from the low $300,000s, and residents enjoy a pool, cabana, firepit and dog park. The model home showcases the beautiful Florance plan, a three-bedroom townhome with an open living area, spacious island kitchen, dining room and family room that opens to an outdoor patio. You’ll especially love this home’s impressive upstairs owner’s suite! Call 678-391-9497 for more information on this quick-selling community – but you should be quick, too, as only two homes remain! The Grove at Adams Pond is a single-family community in Smyrna with a Lowcountry influence starting from the mid-$400,000s. Residents enjoy amazing amenities including a lake, firepit and pocket park. Best of all, you can walk to Smyrna Market Village! The charming Taylor model home features a Charleston-inspired elevation with a covered porch, while the interior echoes the ocean with beautiful blue touches throughout. The first floor of this model is incredible beautiful, but we bet it’s the owner’s suite with spa-like bath that’ll have you swooning! Call 678-391-9492 for more information on The Grove at Adams Pond. 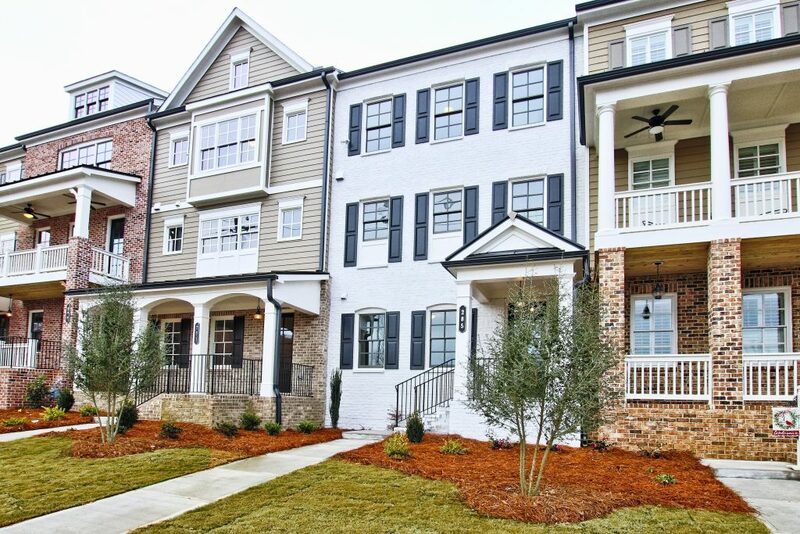 The Registry at Marietta Square offers three-story townhomes with finished terrace levels and two-car rear-entry garages. You even have the option to add an elevator! The decorated model at this sought-after community showcases the Glover home plan, featuring a brick exterior and rich gray shutters that beckon you onto the front porch. The family room with fireplace and covered porch are perfect for entertaining, the kitchen is a cook’s dream, and the upstairs owner’s suite features a luxurious walk-in closet. What area will you fall in love with? Call 678-391-9499 to see this home during April’s Altogether More Model Home Tour. The Reserve at Old Atlanta is a gated community in Suwanee offering the final homes from just $544,900 in the sought-after Lambert High School District. This community offers incredible amenities, from the gated entrance and 36 acres of greenspace to the junior Olympic pool, lighted tennis courts and clubhouse. After you’ve seen the amenities, stop in the Presley model to see the gourmet kitchen with a large island, double oven, and granite countertops, or the always enjoyable screened back porch. This community is nearly sold out, so don’t delay in visiting. Call 678-391-9486 for more information on these final new homes in Suwanee. Windmill Park at Brown’s Farm is the ideal active lifestyle community featuring single-level living in Carrollton. Homes are priced from the mid-$200,000s, and the community is walkable to local dining and shopping destinations. Tour the Portico model home, featuring a walk-up bonus level and functional living spaces, like a private courtyard, gourmet island kitchen, family room, sitting room in the owner’s suite and more. Call 678-391-9491 to plan your tour! Woodland Parc is located within walking distance to The Battery Atlanta and SunTrust Park! Just in time for baseball season, you can call one of these two-story townhomes priced from the mid-$300,000s home. Features included in these townhomes include awnings and mini-Juliet balconies, while man’s best friend will also feel right at home in the community dog park! The decorated model at Woodland Parc is also the Florance plan, a bright and cherry townhome with tons of windows, a well-appointed kitchen, open living area, and outdoor patio. Call 678-391-9495 for more details. Stop by during Traton Homes’ Altogether More Model Home Tour to find out how you can get altogether more from Traton Homes – more desirable locations, more amenities, more home, more community, more lifestyle, more value. Model homes in most communities are open daily from 10 a.m. to 6 p.m. and on Wednesday and Sunday from 1 to 6 p.m. For more information and individual community hours, visit the community pages on www.TratonHomes.com. *No purchase necessary. This promotion is in no way sponsored, endorsed or administered by, or associated with Facebook. You are providing your information to Traton Homes and not to Facebook. The information you provide will not be sold and will only be used for promotional purposes. No Facebook Entry or Like necessary.